Amharic is the official language of Ethiopia and it is spoken widely throughout the nation. Did you know that, after Arabic, Amharic is the most spoken Semitic language in the world? iTypeAmharic is an application developed to help those who would like to share thoughts and ideas with other Amharic speakers. 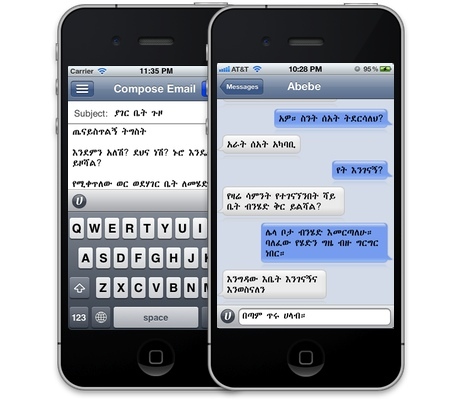 The applications unique ability to send amharic messages directly to other iTypeAmharic users makes it simple to communicate in Amharic on the iPhone. The ability to capture what is written as an image makes it possible to share with those who don't have access to the font. You are now able to compose emails, send SMS messages or even tweet or post to Facebook from your iPhone. Don't let your jokes/proverbs get lost in translation. There is no better way to say what's on your mind than writing it in the original language. የተፃፈ ይወሳል በቃል ያለ ይረሳል። Go ahead and express yourself in Amharic. iTypeAmharic enables composing and sending messages in Amharic directly to others iTypeAmharic users. Messages are enabled after registering an email address, phone number, or facebook account. You can automatically send to anyone in your address book, or any friend on facebook who has enabled Messages on iTypeAmarhic. To send to someone not in your address book simply use their email address or phone number. Each key is translated to the phonetic equivalent in Amharic. For some amharic letters, it is necessary type both the english consonant and vowel. iTypeAmharic enables composing and sending messages over Email and Text Message. Messages can also be posted directly to Twitter and Facebook. Many phones and computers need special fonts installed to display Amharic characters (some are not even capable of installing fonts). iTypeAmharic has the ability to share Amharic text as an image to ensure users are able to read the amharic text. This is available when sharing via Email, or when sharing to Twitter. Looking for ways to learn Amharic? Checkout Amharic Pocket Guide for the iPhone and iPad and Amharic Letters for OSX.